Foundation, it is a wonderful product but it can be so difficult to get a colour match. Especially if you are at either end of the skin tone scale. I have been to MAC and was matched to NW15, however in daylight this was too dark and oxidised on my skin and turned me a lovely shade of orange. I like my foundation to even out my skin tone, cover imperfections and to leave me looking presentable. 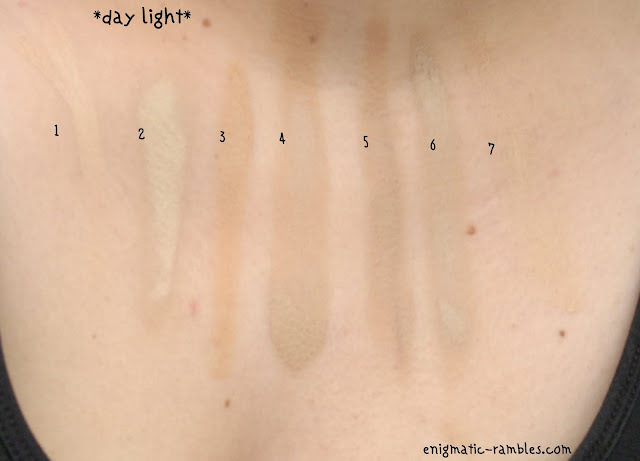 Oxidisation is when your foundation reacts with your skin's natural PH levels. When you first apply the foundation it can match your skin tone perfectly however it may react and changes colour to a orange tone. In other terms it is similar to how iron reacts with oxygen and makes your pipes rusty. Not an attractive look, and the only way to know if this is going to happen is to trial the various formulations out on your skin and see what happens. You may want to test the foundation out on the back of your hand, to see how the formula and texture is. Don't use the back of your hand to match your foundation shade unless you plan on only using the foundation on your hand. Again a lot of people test foundation on their jaw or neck, which may work better than the hand but really you need to be testing on your chest. This will mean you match your body so you don't end up looking as if your head belongs to a someone different. Always blend your foundation down your neck to help make you look like a whole person. Your face is usually a different tone to your neck and body because you may use a SPF on your face which protects it from the sun. Even if this isn't the case the sun hits your face and doesn't hit your neck easily, which means there can be a colour difference. Another point to note is your face may have tone issues such as hyper pigmentation, redness, scars, blotchy patches, dark circles etc. Generally your chest is more of a uniform colour which is why shade matching to your chest is a good idea, even more so if you are planning on wearing anything other than a round neck / turtle neck top. 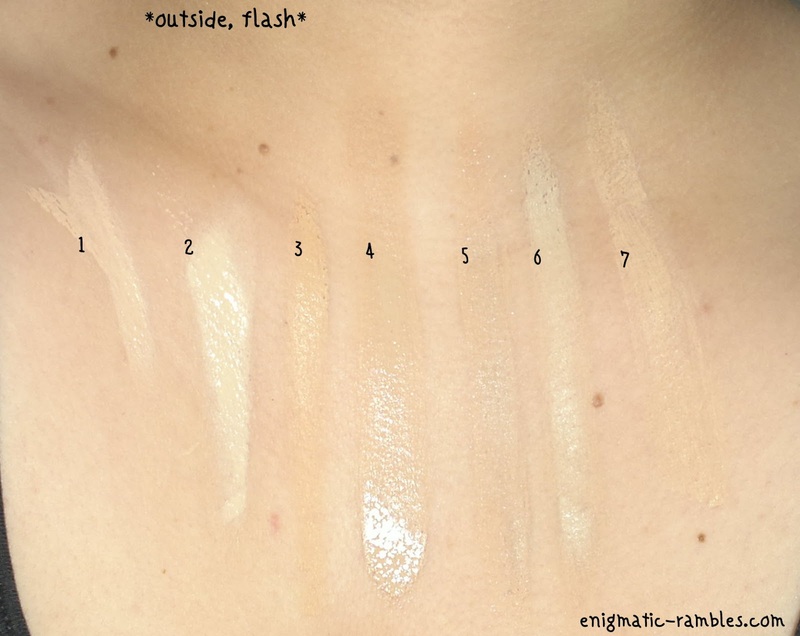 Once you have the foundation swatched on your chest you need to check out what it looks like after 30 minutes or so, to check for oxidisation. Also do check what it looks like in daylight, direct sunlight, artificial light etc. to make sure it looks okay on you in the various light scenarios. An example of the foundation looking different in different light situations is shown below, with the flash on the camera foundations 4 and 5 look a great match to my skin. 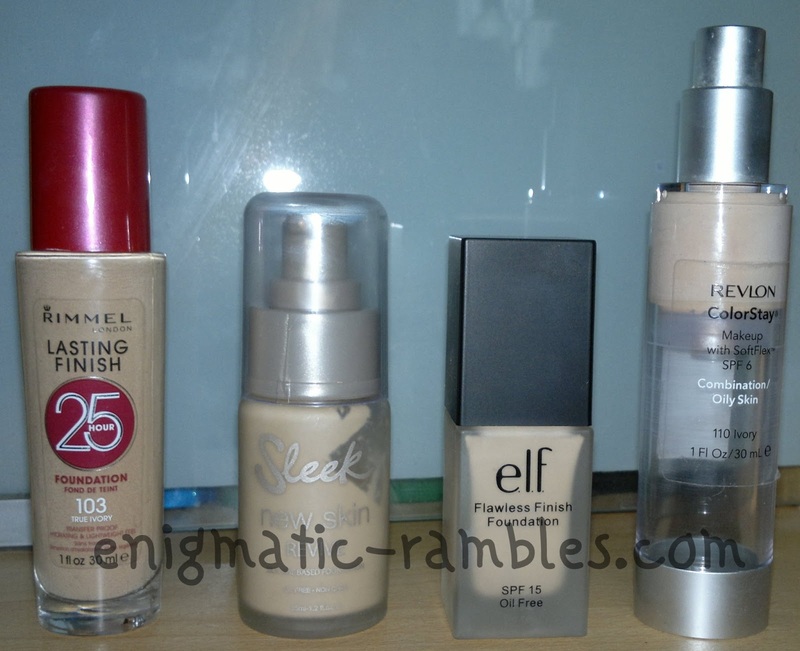 However without the flash, in natural light it is very clear that foundations 4 and 5 are far too dark for me. Also keep in mind that if the foundation has an SPF in it chances are it will react to the flash, it will bounce back the light and make you look very pale, even if you look normal in every other light. This is called flashback. Foundations 1, 2 and 6 are showing up very light in the below photo with the flash on. 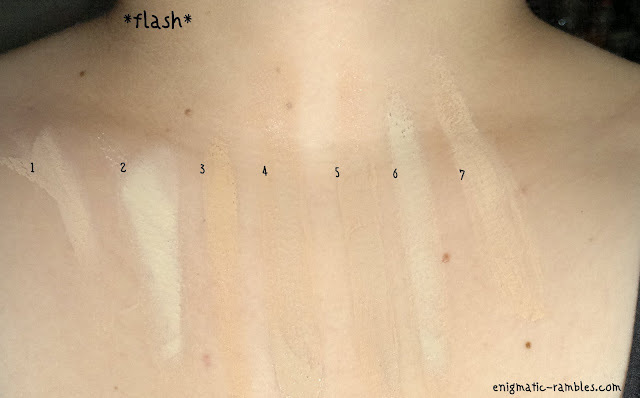 However without the flash turned on the foundations 1, 2 and 6 don't look so ghostly pale. So while at first 1, 2, 6 and 7 may look too pale, once they have oxidised on my skin they deepen. 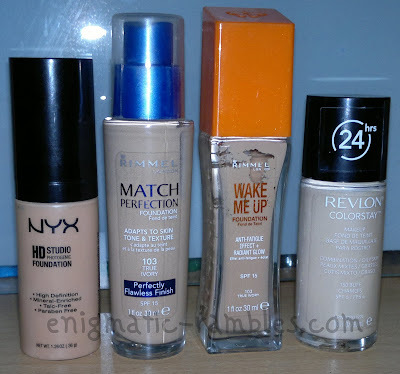 Foundations 3, 4 and 5 look a good match to my skin at first, but once they oxidise they turn out too deep for me. From these seven foundations I think that 1, 6 or 7 are the best matches. I wouldn't say they were perfect by any means but better matches than the others. If you do have foundations which are too dark or too light for you then you can always get a mixing foundation, I have a white one by Barry M which is great for making darker foundations lighter. 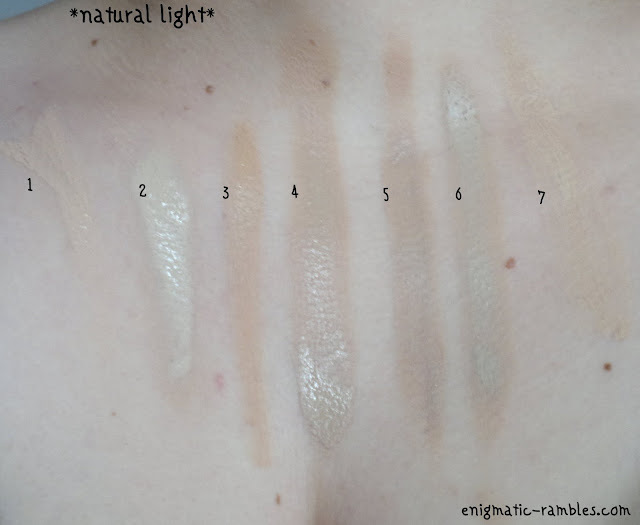 Also MAC do a darker mixing medium which means if your foundations are too light then you can deepen them up with that. I think Illamasqua may also do these mixing mediums.